The first clip from the vampire drama Byzantium has landed online. Directed by Neil Jordan (Interview with the Vampire), the film stars Gemma Arterton and Saoirse Ronan as a mother/daughter vampire duo who arrive in a small British town where their secret doesn’t stay kept for long. This clip is a scene between Ronan and X-Men: First Class star Caleb Landry Jones, and it’s not exactly Twilight. We see Ronan’s character react in slow motion to Jones dropping a fair amount of his blood on the ground. It’s a bit haunting, a bit strange, and slightly disturbing, but I’m wholly intrigued. Hit the jump to take a look. The film also stars Sam Riley and Jonny Lee Miller. 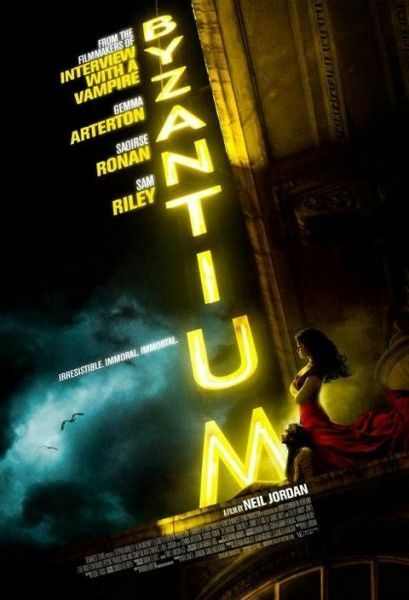 Byzantium will premiere at the Toronto Film Festival, which is currently underway.